"Our Mission is to make Six Sigma Practical, Affordable, and Effective"
MAKATI CITY, Philippines- More than 100 Learning & Development and HR Professionals earned their Six Sigma White Belt Certification last September 22, 2016, at PSTD's September 2016 Tipanan (monthly meeting). The program was facilitated by Six Sigma Master Black Belt Rex Tuozo, known as "The Six Sigma Guy". In the Philippines, Six Sigma = Rex Tuozo. He is the most sought-after Lean Six Sigma Trainer & Consultant in the Philippines, popular for making Six Sigma simple and practical for non-math majors/ non-technical professionals, managers, and executives. He believes that Six Sigma professionals are Expert Facilitators and not Expert in Statistics. "Both HR & LD departments are one of the most hard-working but unappreciated departments of organizations. One of our missions is to help them by making six sigma tools and techniques simple and practical to equip our L&D and HR professionals, so they may think in terms of processes, identify process defects and delays and solve the root causes, to improve internal customer satisfaction," Tuozo added. 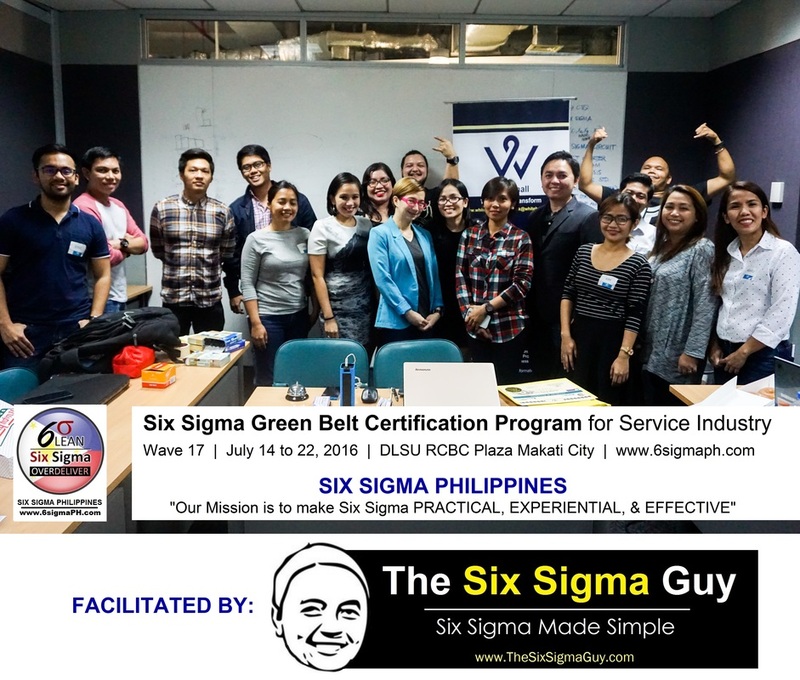 MAKATI CITY, Philippines- Fifteen professionals mostly from service industry completed Six Sigma Philippines' Lean Six Sigma Green Belt Certification Program (Wave 17) last July 22, 2016, at De La Salle University RCBC Plaza Campus, Makati City. Green Belt participant Bubbles Julian, Client Success Manager of Concur Philippines, was quoted saying "(There's) No better way to learn Six Sigma than to immerse yourself in a room full of eager participants with the same tenacity and energy you bring to the table, deftly facilitated by the Six Sigma Guy! ", " Highly engaging and a very relatable workshop," Julian said. ​Another participant, Margeline Caraig, the Continuous Improvement SME of Sunpower said, "Rex made made this certification program not only very educational but also fun and simple The best thing i liked about their program is their 6 Sigma Circuit. They don't focus on the quantity of tools to teach but on the quality of learning that students get. In the Service Industry, not all tools are applicable and for those that are, what matters is you know how to use them properly. 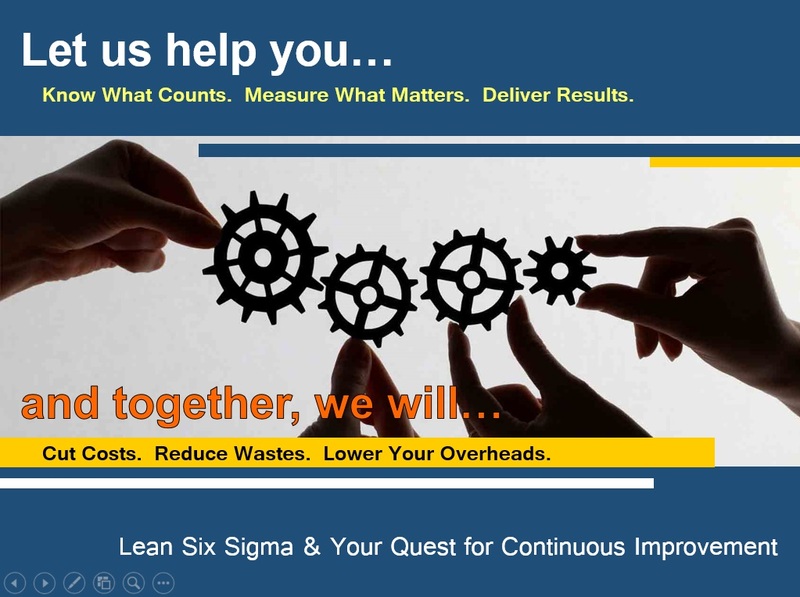 ", "That's what Six Sigma Philippines does," Caraig added. 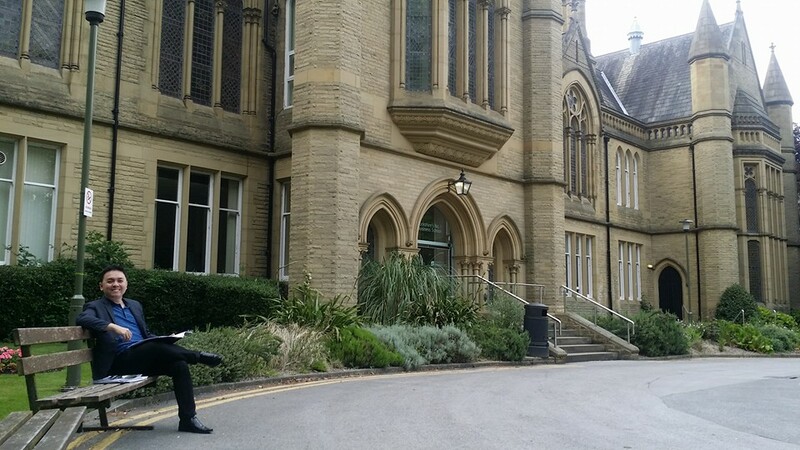 Rex "The Six Sigma Guy" Tuozo, Six Sigma Philippines' Six Sigma Master Black Belt represented the Philippines in participating in the Management of Change program of Bradford University in UK. More than 20 participants worldwide attended the event. For more than 50 years, we have been providing engaging and innovative teaching and learning, and research that makes a difference to the world. With the coveted Triple Crown of accreditations (AACSB, Equis, AMBA) and an international staff and student body, we have created an environment of world-leading management education and research where everyone can flourish. 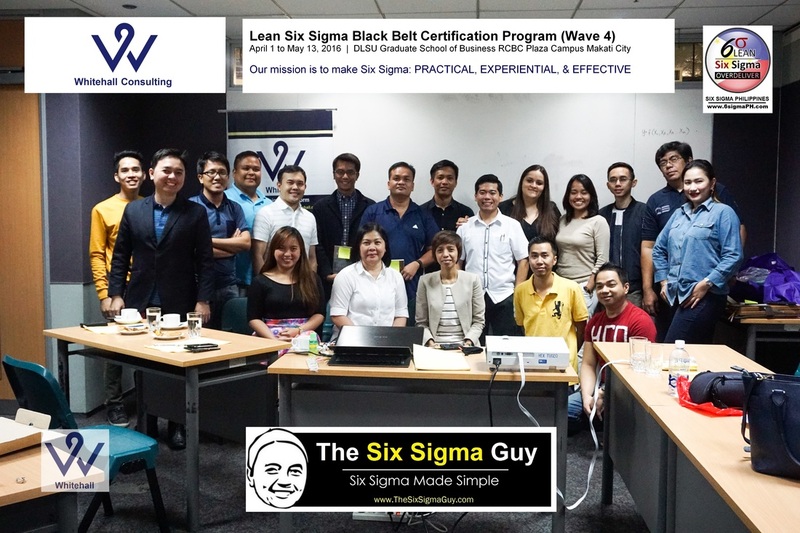 Six Sigma Philippines in partnership with Whitehall Consulting have completed its 4th Wave of Six Sigma Black Belt Certification Program. The program was capped-off with presentations of participants' actual six sigma projects to panel of 3 Certified Six Sigma Black Belts: Mr. Gervy Biagtan, Process Improvement Director Quality and Lean Six Sigma of Teleperformance; Hanz Cubillan, Head of Systems and Methods of Sky Cabl; and Ronilo Quiapo, Six Sigma Manager of CBRE. Black Belt participant Eric Briones, Director for Business Development of Ground Air Freight Forwarding Corp., said "It was certainly fun-filled days as the participants went through Rex's experiential method of teaching. I really like the way Rex simplifies Six Sigma's concepts and how he lets us learn how to use the different tools through an application in a real-world scenario". Another participant, Elena Coronado, a BPO executive, gave a testimonial: "I had a great Experience in this Six Sigma workshop , the way of the workshop is dynamic and experimental which is easy to understand. I learn a lot and I recommend Six sigma workshop of Rex, our Six Sigma Master Black Belt". MAKATI CITY, Philippines- Rex "The Six Sigma Guy" Tuozo, Whitehall Consulting's Six Sigma Master Black Belt awarded Six Sigma Green Belt certification to Luis Penson, VP Marketing and General Manager of CTM Ventures and Equity Group Inc. operators of Hyundai and Suzuki dealerships south of Metro Manila. Penson reduced the average waiting time of preventive maintenance service (PMS) for Hyundai Dasmarinas branch from 76 minutes to 52 minutes using Lean Six Sigma tools and methodology. With the success of his first six sigma project, he started rolling-out several other process improvement projects to other dealership branches of CTM Ventures. "I am impressed with the results of lean six sigma. How it can reduce process delays and process defects which results to happier customers and better profitability of a company. It has also made our employees think in terms of process, and be data driven, and also has helped improve teamwork across different departments," Penson added. 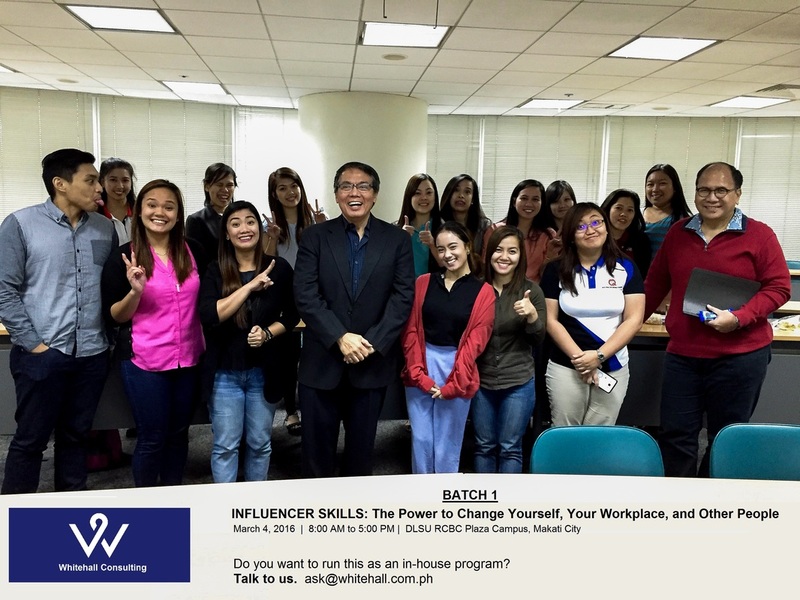 "Mr. Del Rosario made the entire program fun, exciting and easy to understand," said by one participant. Attendees took part in exciting drills that boosted their confidence in handling complex scenarios, structuring impromptu presentations, and planning presentations to be more influential. "I'm glad I am part of this new program. It gave me a structured way on how to improve my influence if I want to implement change at work, for myself, and for other people." MAKATI CITY, Philippines- Rex "The Six Sigma Guy" Tuozo awarded Six Sigma Green Belt Certifications to a telecommunications executive, and a BPO executive. Aldrin Tandang, Sky Cable Corporation Systems and Methods Improvement Manager, attended Six Sigma Philippines' training program in 1st quarter of 2015, and completed his "Reduction of Non-Moving Inventory" process improvement project November of the same year. The project resulted to P8.38 million annualized cost savings. "I have utilized Rex's Six Sigma simplified set of tools, the mindset that six sigma is about being an ambassador of change, an expert facilitator and not an expert in statistics. The support that Whitehall offers- both project coaching and mentoring even after the program, helped me a lot." Certified Six Sigma Green Belt Arthur Flores Jr., an Operations Team Manager of a BPO company in Makati completed his process improvement project about "Reduction of Failed QA%" which resulted to an annualized cost savings of 253,440 GBP or equivalent to P17.16 MM. "What Rex and Whitehall is saying about the Six Sigma program is true: the program will accelerate your career, and you'll be respected and recognized by your boss and peers. Rex is very approachable and his simplified and practical approach of Lean Six Sigma made it effective. The way Rex taught me, helped me a lot." e-mail: ask@6sigmaph.com for comments & inquiries. One of the best international schools in the Philippines meets the number one Lean Six Sigma Training Program provider in the Philippines. LAS PINAS CITY, Philippines- Southville International School and Colleges formalized a partnership with Whitehall Consulting to establish Taylor Center for Professional Development, which aims to support and strengthen the advancement of filipino professionals by offering executive and professional continuing education which are relevant practical and effective. Some programs that shall be offered are Lean Six Sigma Certification Programs for Service Industry, Accelerated Leadership Development Programs, Project Management for Non PMs, PMP Certification Review, How to Talk Like Ted Speakers, Creativity and Innovation Toolbox, Secrets of Influencers- the power to change yourself, your colleagues, and your workplace, etc. Present in the MOA signing held last January 19, 2016 at Southville International School and Colleges at Las Pinas City are (from left to right) Franco del Rosario (Whitehall Leadership and Strategies Program Director), Ceshyr Bauzon (Southville Training Specialist), Marl Ferenal (Southville President), John Fernandez (Whitehall IT Program Director), Ann Gabriel (Southville Training Specialist), and Phi Anh De Castro (Southville Training Manager). 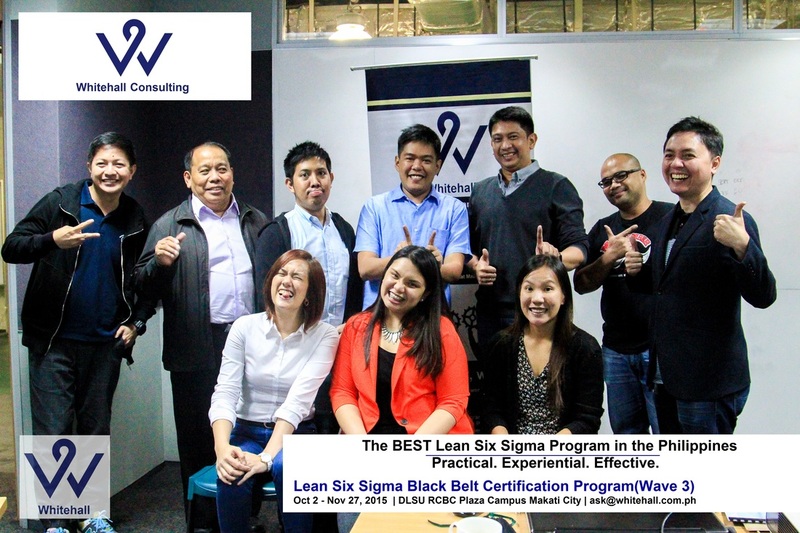 MAKATI CITY, Philippines- Whitehall Consulting completed its 3rd wave of Lean Six Sigma Black Belt Certification Program. Whitehall ensures that at the end of the course, participants have a ready for kick project, or already a running project. Whitehall's Six Sigma curriculums have been updated to fit a more demanding service industry based on a decade worth of experience by its Six Sigma Program Director, Rex Tuozo. "All Six Sigma training providers in the market are still using the outdated Six Sigma curriculum designed by G.E. and Motorolla in the 1980's for manufacturing industry. I have updated the Six Sigma curriculums to fit the needs of the Service Industry which leaning more into the people-side-of-change," Tuozo answered when asked why the curriculums were updated. "Our programs are more practical and experiential to make it effective for non-technical, non-math majors. I also make sure that at the end of all of our Green and Black Belt Six Sigma programs, graduates already have a either a ready-for-kick-off projects or projects already running," Tuozo added. 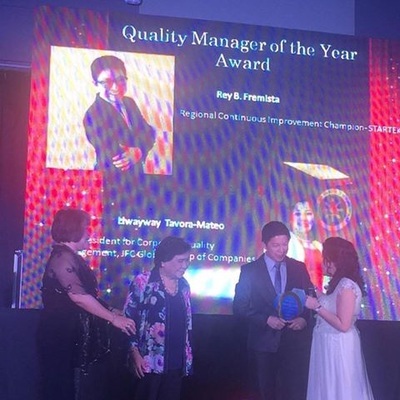 TAGUIG CITY, Philippines- Whitehall Alumni Rey Fremista wins the 2015 Quality Manager of the Year award, by the Philippine Society for Quality. 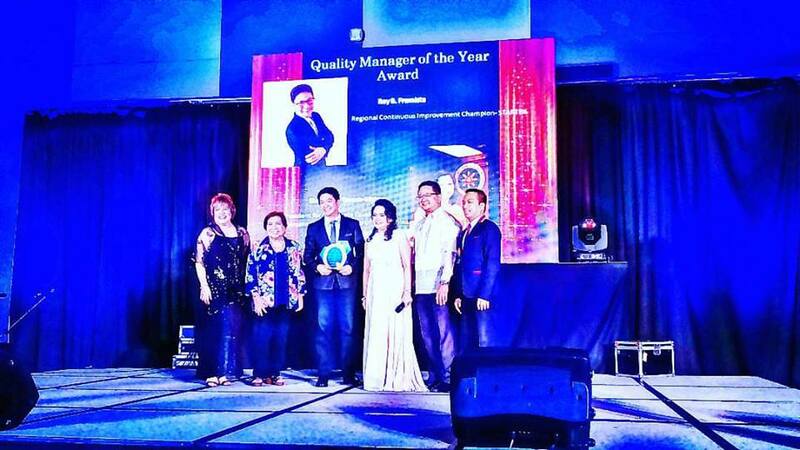 Rey is Six Sigma Philippines Certified Six Sigma Black Belt (March 2014). MAKATI CITY, Philippines- Over 95 participants attended the Philippine Society for Training and Development's (PSTD) August 2015 Tipanan at the DLSU Graduate School of Business RCBC Plaza campus. Networking activities, membership updates, raffle from sponsors and learning event entitled: Creative Thinking and Innovation Techniques using the Six Thinking Hats made the afternoon fun and engaging. Learning event guest speaker Babby Mejia, the Innovations DIrector of Whitehall Consulting facilitated an experiential and hands-on workshop of the use of the Six Thinking Hats: A Tool to Strengthen Critical Thinking, Collaboration, Communication, and Creativity Skills. One participant when asked what her experience in attending the Tipanan like, said, "It is my first time to attend this PSTD Tipanan and I'm glad I did. It was so much fun. I have learned a lot from Mr. Babby Mejia. He was very practical (and) very easy to understand. We can easily apply the concepts and tools he shared. Most of all, I met new friends who like me love to learn (and value) continuing education"
Whitehall Consulting completed its Wave 12 of Lean Six Sigma Green Belt Certification Program. Twenty (20) participants are newly trained Six Sigma Green Belts, and shall be certified upon completion of their process improvement projects with their respective companies, organizations, and businesses. Majority of participants, representing 85% of the class, have invested their own money to enroll to Whitehall Consulting's Six Sigma Program. LAS PINAS CITY, Philippines - WhiteHall's Rex Jayson Tuozo (Lean Six Sigma Program Director) and Jordan Imutan (President & CEO) were guest speakers of Southville International Schools' 25th Founding Anniversary Learning Event. More than 400 faculty and support staff of Southville's 7 member schools attended the event. MAKATI CITY, Philippines - Rex Jayson Tuozo, the Lean Six Sigma Program Director of Whitehall Management Consulting (Six Sigma Philippines is now owned and is the Lean Six Sigma Certifying Body of Whitehall) talks about the trends and future applications of Lean Six Sigma in the Philippines. Tuozo also reports the summary of Whitehall's 2015 Philippine Lean Six Sigma Salary Survey. For the last and final speaker of the conference, Whitehall's Leadership and Strategies Program Director talks about key ingredients for a successful process improvement program. With over 100 attendees this year, the yearly Lean Six Sigma and Process Improvement Conference has been instrumental in pushing for the use of Lean Six Sigma not just to multinational companies here in the Philippines but also to Small and Medium Enterprises (SMEs), Government, Healthcare, and even to Non profit organizations. MANILA, Philippines - Over 750 Industrial Engineering students of the Polytechnic University of the Philippines (PUP) attended its 2015 IE convention entitled IEXPLORE: Trendsetting. Transforming. Trailblazing last February 6, 2015 at Bulwagang Balagtas, PUP, Sta. Mesa Manila. Mr. Rex Tuozo, the Lean Six Sigma Program Director of Six Sigma Philippines delivered a talk about SIx Sigma overview and Six Sigma career for Industrial Engineers in the Philippines as part of its thrust to educate future Filipino professionals. Six Sigma Philippines welcomes invitations from schools and universities. For details, please e-mail ask@6sigmaph.com. MAKATI CITY, Philippines - Six Sigma Philippines, the fastest growing and leading provider of Lean Six Sigma training and certification programs in the Philippines, launches its Executive Education e-Learning Training Programs on Project Management and PMP Exam Prep, ITIL, SCRUM, PRINCE2, Business Analysis (CBAP). NEW YORK CITY, USA - Six Sigma Philippines Managing Consultant, Rex Jayson Tuozo, represented the Philippines in ATD's (formerly ASTD- American Society for Training and Development) Change Management Summit held at New York City last December 4 & 5, 2014. Change Management and training professionals from USA, Canada and EU attended the event. The Association for Talent Development (ATD), is the world’s largest association dedicated to those who develop talent in organizations. These professionals help others achieve their full potential by improving their knowledge, skills, and abilities. Six Sigma Philippines will launch its Change Management Certification Program in 2015. Watch out for it. 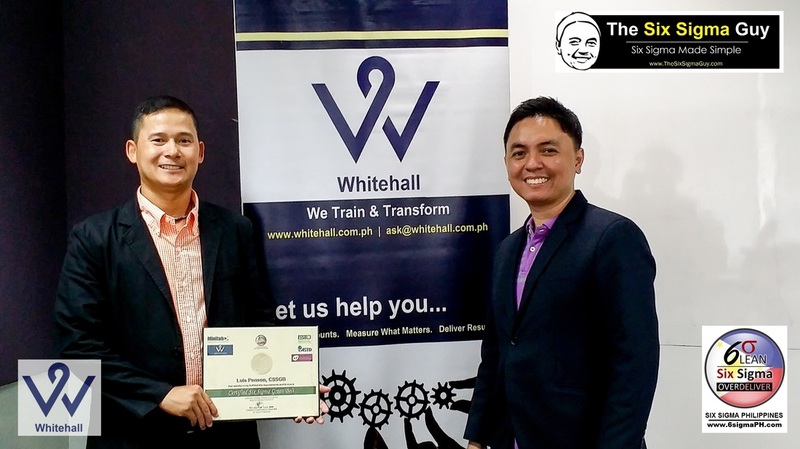 LONDON, U.K. - Six Sigma Philippines Managing Consultant, Rex Jayson Tuozo, earned his PROSCI Change Management Certification after completing its rigorous training and certification. In the Philippines, as of December 2014, not more than 10 Filipinos have been certified as a Change Management Professional by PROSCI. Founded in 1994, Prosci is the world leader in bench-marking research and change management products. Prosci’s tools and methodology—based on best practices research with over 3400 international organizations—are used by more than three quarters of Fortune 100 companies. The Prosci methodology has become one of the most widely used approaches to managing the people side of change in business and government. Six Sigma Philippines at SYKES FOCUS Conference 2014- for Quality and Learning & Development Professionals. PASIG CITY, Philippines - Rex Tuozo of Six Sigma Philippines and Board of Trustee of Philippine Society for Training and Development (PSTD), talked about how having a Lean Six Sigma mindset can mitigate the threats of the upcoming ASEAN integration at SYKES FOCUS Conference 2014, held at Marco Polo Hotel Ortigas. Mr. Tuozo also gave an overview of the Workplace Learning and Performance (WLP) certification program of PSTD which aims to upgrade, professionalize and regulate the practice of WLP in the Philippines by assessing and classifying WLP practitioners according to proficiency levels using the twelve WLP competencies as standard. (for more information about PSTD's WLP Certification, e-mail us at ask@6sigmaph.com). Other keynote speakers were Mr. Alfredo "Butch" Hernandez Jr., the Education Lead for Talent Developmet of the IT Business Process and Outsourcing Association Philippines (iBPAP), and Dr. John Kruper, the Chief Learning Officer of Sykes. MAKATI CITY, Philippines- Managing Consultant, Rex Tuozo, delivers Six Sigma White Belt Training to MBA students of De La Salle University- Graduate School of Business as part of its Organizational Development class. Social Psychology Network (SPN) is an educational organization with over 11,000 members worldwide. Founded by Scott Plous in 1996, the Network grew in its first three years to include more than 3,500 searchable links and three affiliated partner sites: the Society of Experimental Social Psychology (SESP.org); the Society for Personality and Social Psychology (SPSP.org); and Research Randomizer (Randomizer.org, a web-based tool for random sampling and random assignment). iAcademy School of Continuing Education's NEW campus- iAcademy transfers to its new campus at Mondragon Building, Gil Puyat (Buendia Avenue) corner Tordesillas Street, Salcedo Village, Makati City. TAGAYTAY CITY, Philippines - Rex Jayson Tuozo, the Managing Consultant of Six Sigma Philippines, has been elected as Board of Trustee of Philippine Society for Training and Development (PSTD). The Philippine Society for Training and Development (PSTD) is the premier professional organization dedicated to providing development and learning opportunities, glocal standards and ethical guidelines to its members in the practice of Workplace Learning & Performance. PSTD members adhere to a robust WLP certification system that enables them to be credible in the delivery of services, organizational results, and sustainable growth. Six Sigma Philippines is now a member partner of American Society for Training and Development.